Canada Day at Canada Place is Vancouver’s biggest Canada Day celebration. Head down to the sails between 10 a.m. and 6 p.m. for live music, street hockey, circus performers and many more free family activities, then stick around for the Canada Day Parade and fireworks. The parade starts at 7 p.m. on Georgia and Broughton Street, moves eastbound, turns left on Burrard and ends on West Pender. Then, at 10:30 p.m., the Burrard Inlet Firework Show will light up the sky above Coal Harbour. Grab tickets to the Hudson's Bay Firework Viewing Zone ($15 each) for the best view of Vancouver’s only two-barge simultaneous pyrotechnic extravaganza. With its own parade, live music and a giant cake, Granville Island is the place to be this Canada Day. 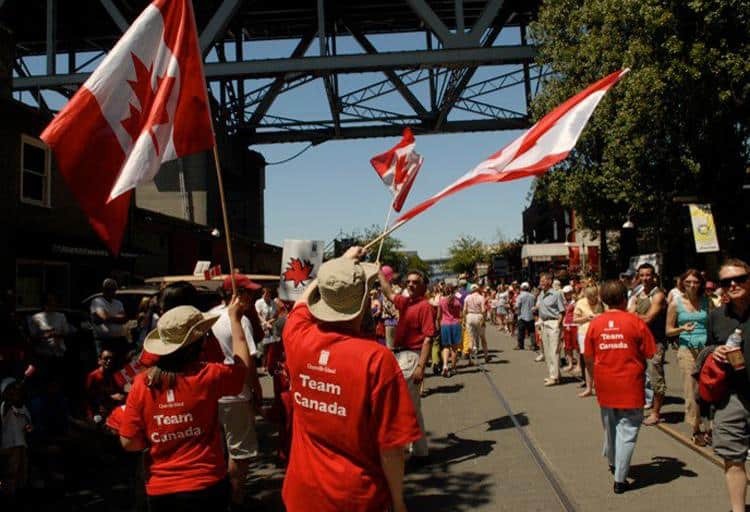 The Granville Island Canada Day Parade starts at 1:30 p.m. at Ocean Construction and ends at 2 p.m. at Ron Basford Park where there will be a Canada Day ceremony with free cake for all. 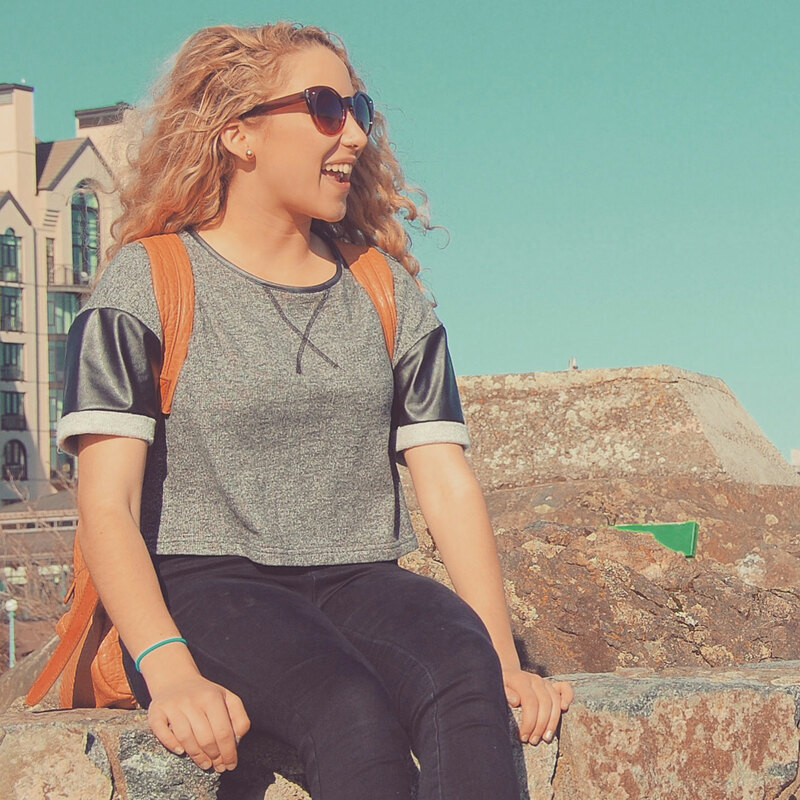 The Kids Market on Granville Island will be hosting free activities for kids all day long and performers from the Vancouver TD International Jazz Festival will be playing on four different stages around the island from noon to 9:30 p.m. 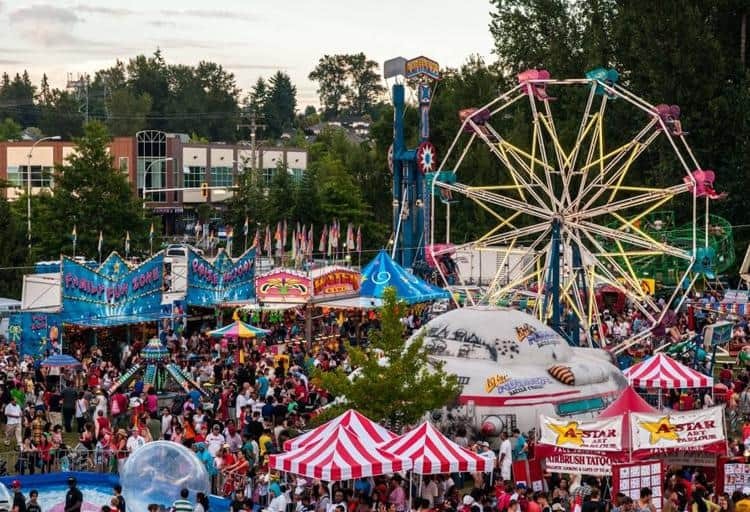 Mela!, a world fair, will be happening on the eastern side of Granville Island where there will be cultural displays, food, fashion and fun. 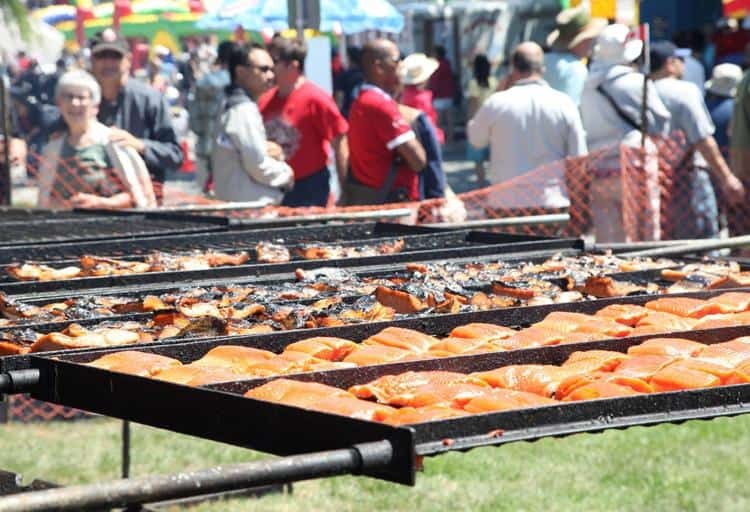 If you love seafood, you'll want to be at Richmond's annual Steveston Salmon Festival this Canada Day. There will be a parade at 10 a.m. through the historic Steveston Village followed by an opening ceremony at noon that will kick off a full day of festivities. The event’s main attraction is a giant salmon BBQ where over 1200 lbs of wild salmon fillets are grilled over open firepits, so bring an appetite. 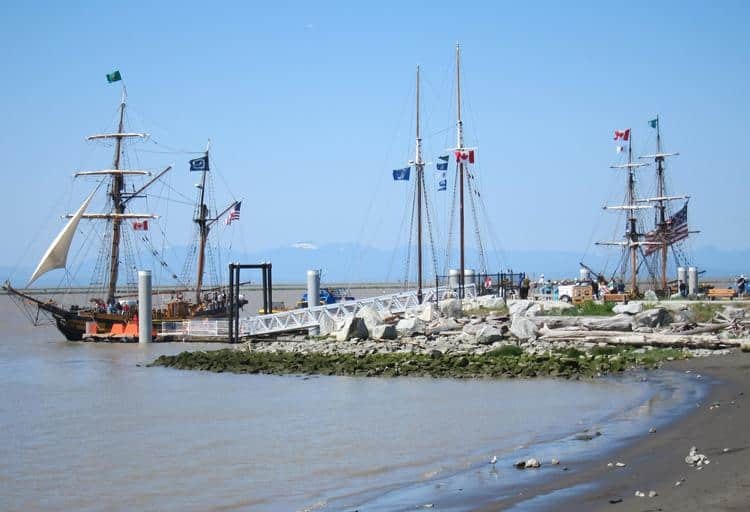 Happening in conjunction with the Salmon Festival, history comes alive this Canada Day at the Steveston Ships to Shore Festival. Over 20 working and historic ships will be on display along the Steveston Waterfront at Imperial Landing and Britannia Shipyards National Historic Site for free public viewing and on-board tours. Dragon boating and canoe carving demonstrations, roaming pirates and Steveston's first-ever sidewalk drawing competition will provide entertainment throughout the day until the fireworks show at 10:15 p.m.
Concerts, fireworks, carnival rides... Surrey certainly knows how to celebrate Canada's birthday. Festivities begin at 10 a.m. at the Bill Reid Millennium Amphitheatre (corner of 176 Street and 64 Avenue) where there will be everything from sports demonstrations to food trucks to Ferris wheels. An array of talented performers, including rock legends Blue Rodeo, will play on the Chevron Main Stage throughout the day and fireworks will light up the sky at 10:15 p.m.
Didn’t get a chance to snag tickets to a FIFA Women’s World Cup match? 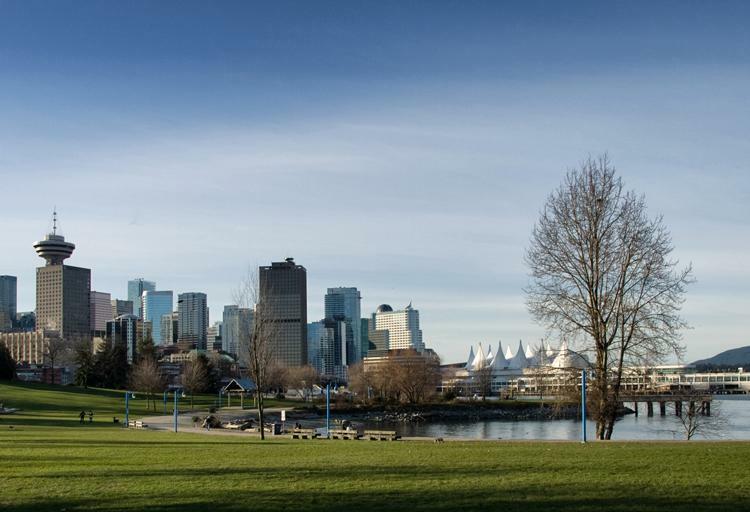 You can still experience the magic of the World Cup at the Canada Day FIFA Fan Zone in Larwill Park (on the corner of West Georgia and Cambie Street). 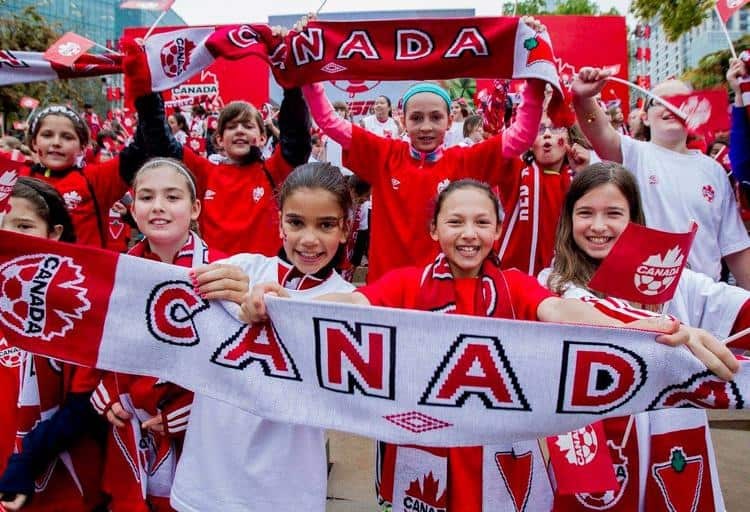 From 12 p.m. to 8 p.m., there will be live music, sports demonstrations, food trucks, a giant beer garden and more, so put on a Canadian jersey and show your national pride. 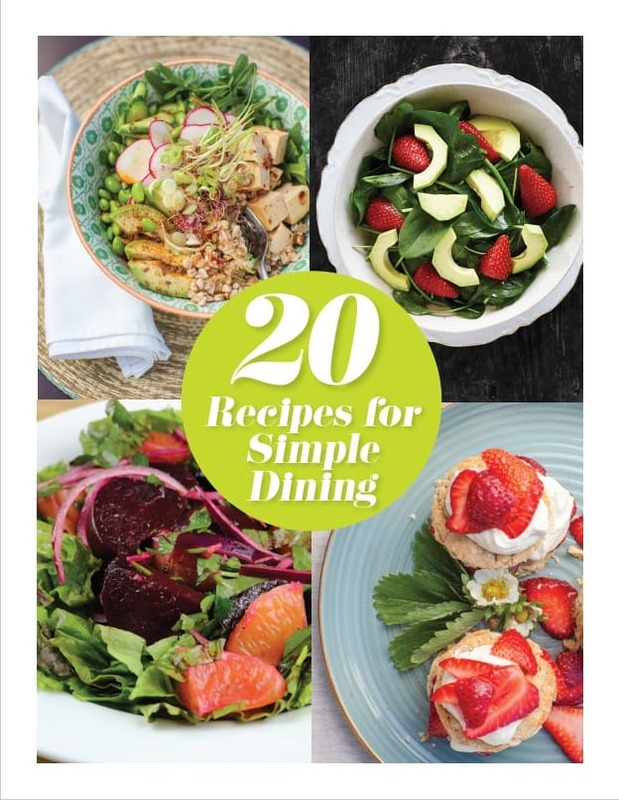 Hungry for some Canada Day fun? 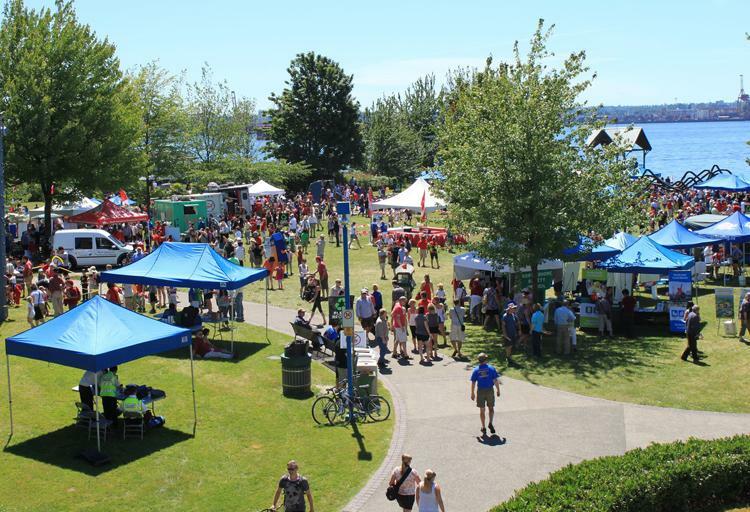 Dress up in Canada's national colours and head to John Lawson Park in West Vancouver for the Canada Day Red and White Picnic. 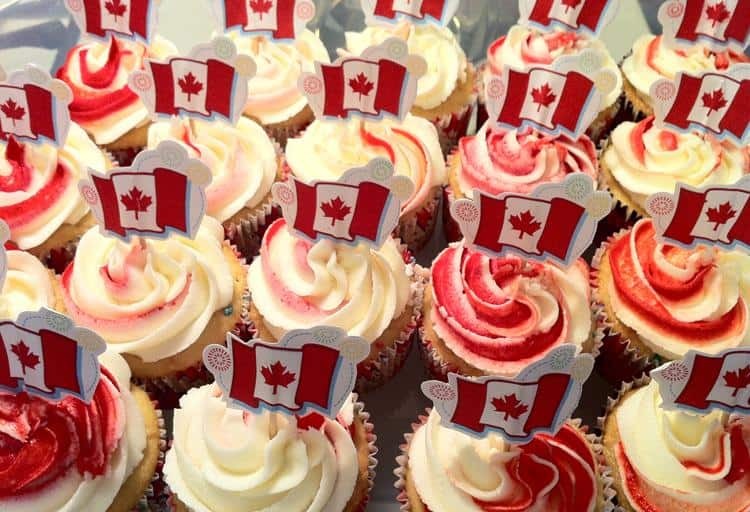 Pack your own Canada-themed treats or pick something up from the array of food vendors on-site. 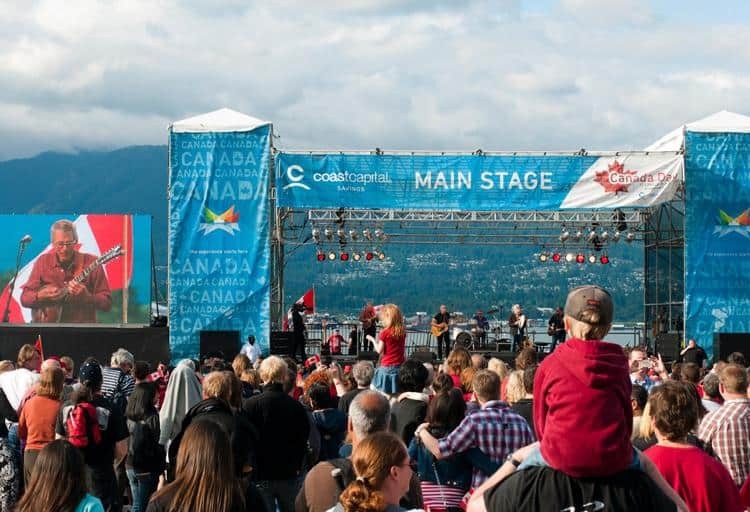 There will be live entertainment on the Great Canadian Stage from 4:30 p.m. until the Burrard Inlet Fireworks Show at 10:30 p.m.
For more fun on the North Shore, catch the North Shore Canada Day parade starting at 10 a.m. at 13th Street and Grand Boulevard, then head to Waterfront Park for everything from art to free kids activities. Local music and dance groups, including pop-rock band The Bob Cats and reggae group Mostly Marley, will provide live entertainment throughout the day while local artisans and crafters will display their work along the seawall as part of the Canada Day Artisan Craft Fair. Festivities take place from 12 p.m. to 4 p.m.
Come rock the Downtown Eastside this Canada Day at the annual Crab Park Canada Day Festival. From 1 p.m. to 4 p.m., there will be three free concerts featuring rock bands the Rootabeggers, the Pernell Reichart Band and the Stinging Hornets, so come ready for a rockin’ time. The Sunset Community Centre in Mount Pleasant is the perfect place to celebrate Canada Day with the whole family. From 12 p.m. to 4 p.m., there will be music, dance, carnival games, face painting and much more. 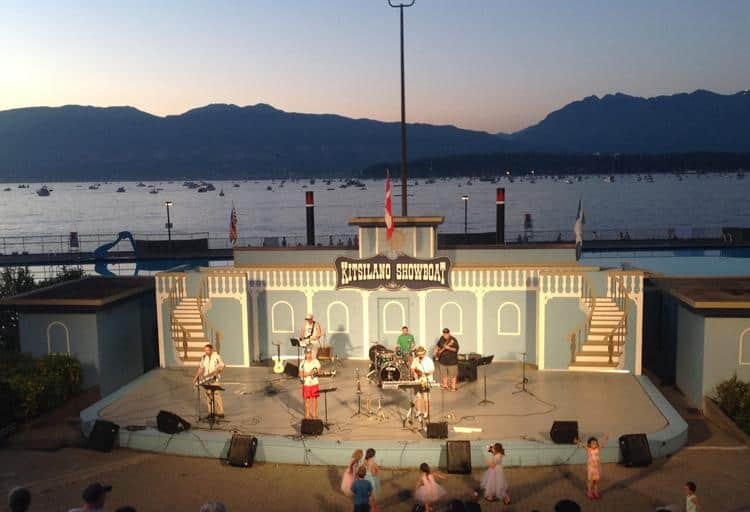 If you’re looking for something to keep the kids busy all afternoon, bring them to the Kitsilano Showboat for loads of kid-friendly fun. 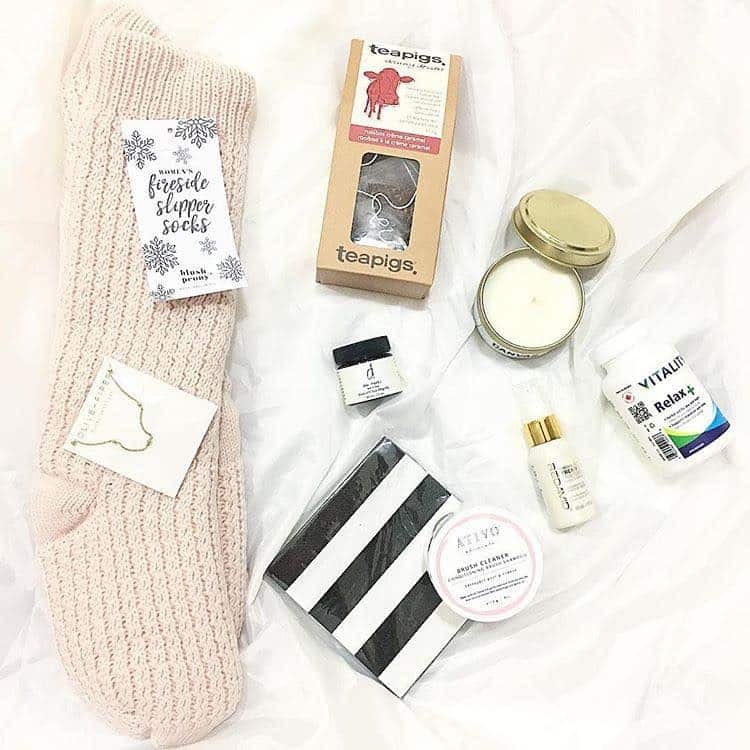 There will be entertainment, cake, games and more, including a free family yoga class put on by Yoga Buttons and a performance by children's entertainer extraordinaire Max Tell. 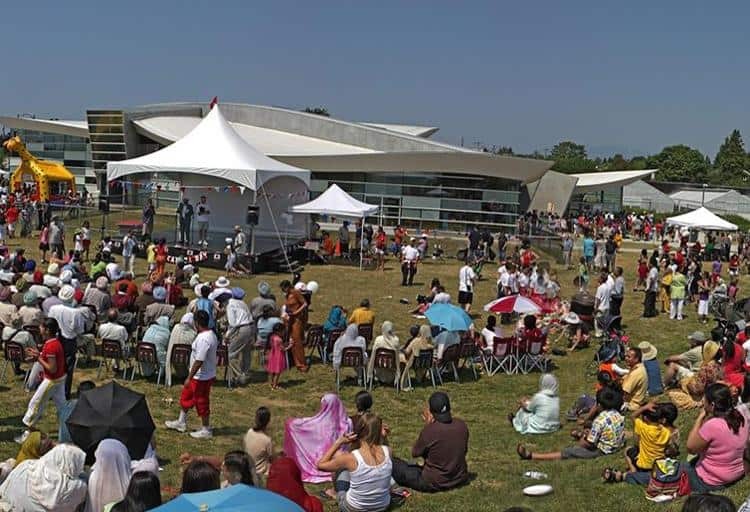 Cake will be served at 5 p.m. and the evening will end with a performance from Jazz Band Sanctuary All Stars at 7 p.m.
From 12 p.m. to 10:30 p.m., Town Centre Park in Coquitlam will come alive with Canada Day festivities. 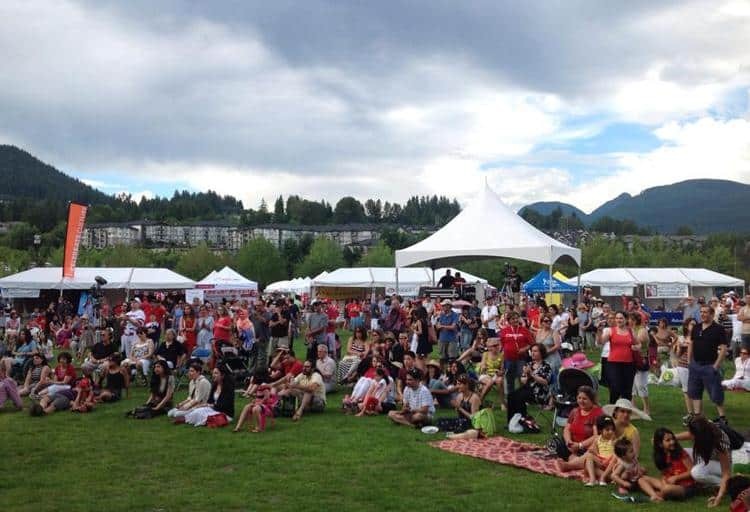 There will be live performances from the Good Day Sunshine Band, The Coquitlam Youth Orchestra and many more on three stages throughout the park while several Canada Day villages representing different aspects of the community bring arts, culture and flavour to the day. At 1:45 p.m. everyone wearing a red or white shirt is invited to the North end of Lafarge Park to be part of a living Canada flag and at 10 p.m. fireworks will explode over Lafarge Lake.